In this study, a boron carbide (B4C) reinforced copper based Metal Matrix Composites (MMCs) manufactured by powder metallurgy method and tribological behavior of compacted composites were investigated. B4C reinforcement was selected at different ratio from 2%wt to 10%wt. Powders was compacted under 735±1 MPa pressure in a die with cold pressing method. Sintering of the samples was performed at two different sintering time as 1 hour and 3 hours under Ar gas atmosphere at 900 °C. Tribological tests were performed by using a computer aided pin-on-disc experimental setup under dry sliding conditions. Tribological tests were performed from 1 hour to 5 hours. And wearing surfaces were investigated in a Scanning Electron Microscope SEM) and mechanisms of the wear were detected. In addition to that tribological behavior and porosity properties of the manufactured samples were investigated. It was found that the porosity of the samples was increased with increasing B4C content. Nevertheless, wear resistivity increased with increasing reinforcement content. A. Baradeswaran, A.E.P., Influence of B4C on the tribological and mechanical properties of Al 7075–B4C composites. 2013. Varol, T. and A. Canakci, Effect of particle size and ratio of B4C reinforcement on properties and morphology of nanocrystalline Al2024-B4C composite powders. Powder Technology, 2013. 246: p. 462-472. A. Baradeswaran, S.C.V.b., A. Elaya Perumal, N. Selvakumar, R. Franklin Issac, Experimental investigation on mechanical behaviour, modelling and optimization of wear parameters of B4C and graphite reinforced aluminium hybrid composites. 2014. M. Uthayakumara, S. Aravindan b, K. Rajkumarb, Wear performance of Al–SiC–B4C hybrid composites under dry sliding conditions. 2013. R. Sathıskumar, N.M., I.Dınaharan, S.J. Vıjay, Fabrıcatıon And Characterızatıon Of Cu/B4C Surface Dıspersıon Strengthened Composıte Usıng Frıctıon Stır Processıng. 2014. Huiying Zhu, Y.N., Chucheng Lin, Liping Huang, Heng Ji, Xuebin Zhengn, Microstructures and tribological properties of vacuum plasma sprayed B4C–Ni composite coatings. 2013. Gode, C., Mechanical properties of hot pressed SiCp and B4Cp/Alumix 123 composites alloyed with minor Zr. Composites Part B-Engineering, 2013. 54: p. 34-40. Canakci, A., et al., Synthesis of novel CuSn10-graphite nanocomposite powders by mechanical alloying. Micro & Nano Letters, 2014. 9(2): p. 109-112. Sathiskumar, R., et al., Characterization of boron carbide particulate reinforced in situ copper surface composites synthesized using friction stir processing. Materials Characterization, 2013. 84: p. 16-27. H.R. Akramifard, M.S., ⇑, M. Sabbaghian a,b, M. Esmailzadeh b,c, Microstructure and mechanical properties of Cu/SiC metal matrix composite fabricated via friction stir processing. 2014. L. M. Manocha, G.P., and S. Manocha, Carbon-Ceramic Composites for Friction Applications. 2014. Ali Mazahery, M.O.S., Influence of the hard coated B4C particulates on wear resistance of Al–Cu alloys. 2012. Canakci, A., et al., Microstructure and Abrasive Wear Behavior of CuSn10-Graphite Composites Produced by Powder Metallurgy. Powder Metallurgy and Metal Ceramics, 2014. 53(5-6): p. 275-287. Unal, H. and A. Mimaroglu, Friction and wear performance of polyamide 6 and graphite and wax polyamide 6 composites under dry sliding conditions. Wear, 2012. 289: p. 132-137. Cuvalci, H. and H.S. Celik, Investigation of the abrasive wear behaviour of ZA-27 alloy and CuSn10 bronze. Journal of Materials Science, 2011. 46(14): p. 4850-4857. Cuvalci, H. and H. Bas, Investigation of the tribological properties of silicon containing zinc-aluminum based journal bearings. Tribology International, 2004. 37(6): p. 433-440. Patnaik, A., et al., Tribo-performance of polyester hybrid composites: Damage assessment and parameter optimization using Taguchi design. Materials & Design, 2009. 30(1): p. 57-67. ISNAD IPEK, Huseyin . "Tribological Properties of Boron Carbide Reinforced Copper Based Composites". 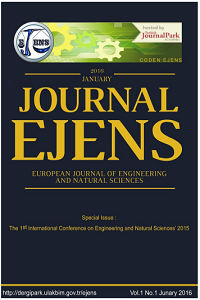 European Journal of Engineering and Natural Sciences 2 / 1 (February 2017): 102-107.